Municipalities are increasingly making use of their scope for globally sustainable development policy. The ASA Municipal programme brings together young people and municipalities which engage in development-based municipal partnerships and projects in Germany and abroad. Is your municipality interested in linking up with a German municipality? But where are you going to start, and what resources will you use? Here the Service Agency can support you in taking the first steps, and the steps after that, towards a successful municipal partnership. We would be glad to advise you on locating a suitable partner municipality, or in shaping the work of your existing partnership. Let us join forces, and seize the opportunities offered by getting together and sharing ideas and experiences. Are you seeking a municipal partnership for development, or would you like to develop an existing relationship further? Would you like to share information with other municipalities, and obtain tips and ideas? Here you will find an overview of our projects with municipalities in specific countries and regions of the Global South. Would you like to get involved in climate change mitigation and adaptation? Or are you interested in sharing expertise for sustainable development, good governance or participatory budgeting? In the following projects, the Service Agency offers you numerous opportunities to get involved. If you are looking for expert support to further develop your partnership with a German municipality, or if you would like to involve young people in your twinning scheme or project partnership – then we have three programmes to support you. How can German municipalities and their partners obtain financial support for their development projects? We will show you what the current options are, and support you in submitting applications in the fields of municipal climate change mitigation and sustainable local development. 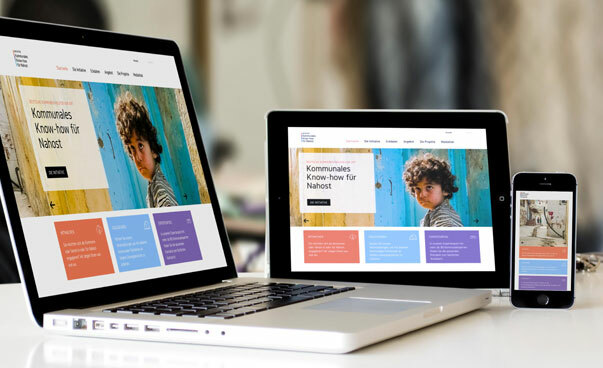 The online platform on the initiative ‘Municipal know-how for host communities in the Middle East’ provides users with information on the project as well as news from the region, and enables them to share information and ideas online.